Motorcycle accidents often result in serious life-threatening injuries and many times are fatal. The highly skilled lawyers at Giometti & Mereness, P.C., have nearly three decades of experience in motorcycle accident cases. At our law firm, we represent individuals, families and insurance companies in a variety of motorcycle accident-related cases. Whether you require representation for a personal injury, insurance or wrongful death case, we are committed to providing knowledgeable and outstanding legal services. For more information about motorcycle accidents and how we can help your case, contact us to schedule an appointment with one of our experienced Denver motorcycle accident attorneys. If you or a loved one has been seriously or fatally injured in a motorcycle accident, we can represent you in a personal injury or wrongful death case. 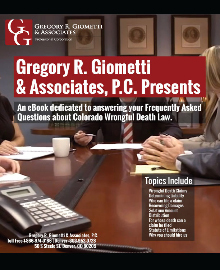 Attorney Gregory Giometti has 31 years of experience and literally wrote the book on Colorado wrongful death law. Motorcycle accident injuries often include serious head and brain trauma as well as life-changing spinal cord injuries. These types of injuries require a lifetime of special care. We can evaluate and investigate your case to determine the best course of action possible for an effective outcome. We have the experience to handle any negotiations, trials and appeals for your case. Contact us at our law firm in Denver, Colorado, to set up an appointment regarding your motorcycle accident matter with one of our experienced Denver motorcycle accident attorneys. Call 303-333-1957 or e-mail us for more information.